What does Classic mean? Classic is never outdated, never embarrassing and is proof of a sense of style. It fits everything and is useful in every situation. It fits everyone, not only the rich and the snobs. The classic can be simple or sophisticated but it is never vulgarly ornate. The golden rule of moderation is what distinguishes it from all other things. So, how does the Q WORKSHOP understand the Classic RPG dice? 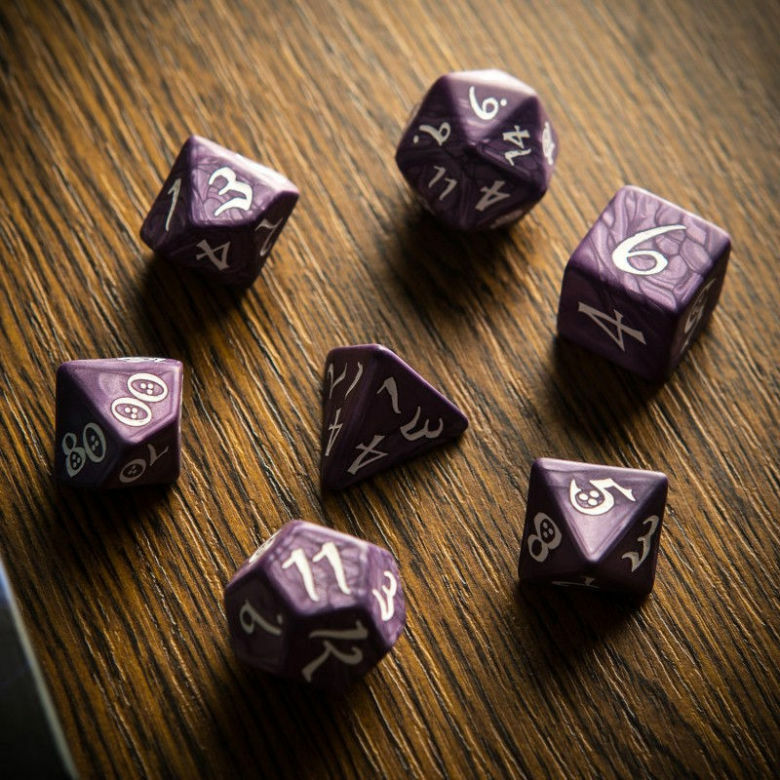 It is a Set of Polyhedral Dice made from best materials according to a classically elegant design and crafted with simple but beautiful elven font, readable as never before. These are no trinkets. It is a very useful set for all games. Available in many colors, these dice should help your heroes explore dungeons, fight with dragons, and let them find the right adventurous path in all worlds. These sets will be your friends. Take them with you wherever you play your favorite games. 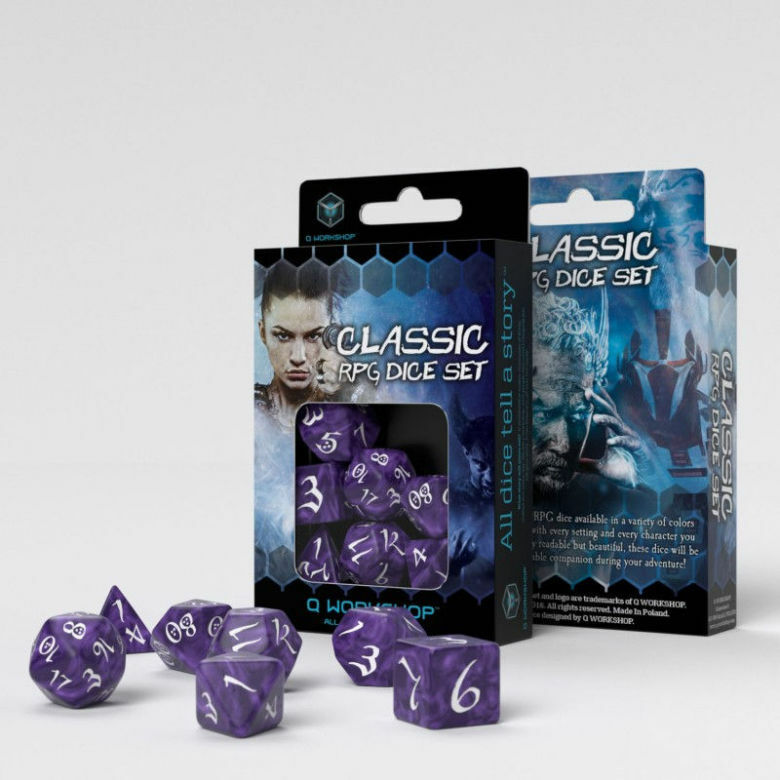 We are proud of our Classic Dice Sets because the simplicity of these game-tools has been combined with aesthetics. NO one has the right to say that Classic means boring and ordinary. We create beautiful dice, Classic are not a deviation from this principle. Colors play a very important role in our lives, whether we realize it or not. They have the ability to affect our emotions and moods in a way that few other things can. When you create your character, you should ask yourself what color suits your hero? What will be the best way to show his personality and tell something about it to other players. Maybe it is also worth choosing a special color for him. This non-verbal signal can be a great help to create a more immersive atmosphere during the game. 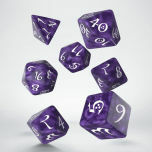 A warrior mage should roll red and peaceful mystic green or maybe purple because he is noble? 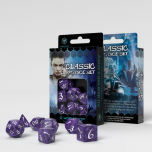 Show your colors with our Classic Dice Sets. For example: Classic RPG Lavender & white - do not be fooled by this kind of floral color, because the arrows of forest elves hurt the same as others, but they have lavender darts. These are, therefore, dice for aesthetes who do not care about the judgments of others, love beautiful colors and even in a garland of lavender, they still can defeat any monster.